Trade in goods and services is likely to be an important channel for international knowledge diffusion. 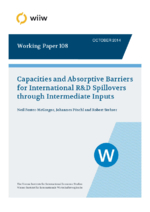 This paper considers the extent of R&D spillovers through intermediate inputs for a sample of up to 40 developed and developing countries. Results suggest that such spillovers are present and are economically important. We find that countries and industries initially further behind the technological frontier enjoy stronger foreign R&D spillovers. Furthermore, foreign R&D spillovers are stronger in countries with greater absorptive capacity as measured by average years of secondary schooling and R&D spending. In terms of absorption barriers, the results are mixed: With the exception of regulations on temporary workers we find that stronger labour market regulation and greater union density is associated with lower foreign R&D spillovers. The evidence for other absorption barriers related to product market, financial and investment regulation provide however no evidence of low regulation encouraging foreign R&D spillovers, with - in some cases - the reverse being found to hold true. Finally, we find that stronger levels of IPR protection can limit the extent of foreign R&D spillovers, possibly by limiting the ability to copy and borrow technology from abroad.